Snooker table, drawn to scale, with starting positions of all object balls and the cue ball placed within the "D" for a break-off shot. Snooker is a cue sport that is played on a baize-covered table with pockets in each of the four corners and in the middle of each of the long side cushions. It is played using a cue and snooker balls: one white cue ball, 15 red balls worth one point each (sometimes played with fewer red balls, commonly 6 or 10), and six balls of different colours: yellow (2 points), green (3), brown (4), blue (5), pink (6), black (7). A player (or team) wins a frame (individual game) of snooker by scoring more points than the opponent(s), using the cue ball to pot the red and coloured balls. A player (or team) wins a match when they have achieved the best-of score from a pre-determined number of frames. The number of frames is always odd so as to prevent a tie or a draw. Snooker is played on a rectangular snooker table with six pockets, one at each corner and one in the middle of each long side. The table usually has a slate base, covered in green baize. At one end of the table (the baulk end) is the baulk line, which is 29 inches (74 cm) from the baulk cushion (the short cushion at the baulk end). A semicircle of radius 11 1⁄2 inches (29 cm), called the D, is drawn behind this line, centred on the middle of the line. The cushion at the other end of the table is known as the top cushion. A regulation (full-size) table is 12 ft × 6 ft (3.7 m × 1.8 m); because of the large size of these tables, smaller tables are common in homes, pubs and other places where space is limited. These are often around 6 feet (1.8 m) in length, with all the dimensions and markings scaled down accordingly. The balls used are sometimes also scaled down, and/or reduced in number (in the case of the reds) by omitting the longest row of balls in the rack. Snooker balls, like the balls for all cue sports, are typically made of phenolic resin, and are smaller than American pool balls. Regulation snooker balls (which are specified in metric units) are nominally 52.5 mm (approximately ​2 1⁄15 inches) in diameter, though many sets are actually manufactured at 52.4 mm (about ​2 1⁄16 in) No weight for the balls is specified in the rules, only that the weight of any two balls should not differ by more than 0.5 g. Some recreational sets (which are usually not measured metrically) are ​2 1⁄8 in (about 54 mm) up to as large as pool balls, at ​2 1⁄4 in (about 57.2 mm); larger ball size requires wider pocket openings. Miniature sets also exist, for half-size home tables. There are fifteen red balls, six "colour" balls (yellow, green, brown, blue, pink, and black), and one white cue ball. Usually none of the balls are numbered, though the six colour balls often are in the US, where they are easily mistaken at first glance for pool balls (the design is similar, but the numbering does not match pool's scheme). At the beginning of a frame, the balls are set up in the arrangement shown in the illustration. The six colours (a term referring to all balls except the white and the reds) are placed on their own spots. On the baulk line, looking up the table from the baulk end, the green ball is located where the "D" meets the line on the left, the brown ball in the middle of the line, and the yellow ball where the "D" meets the line on the right. This order is often remembered using the mnemonic God Bless You, the first letter of each word being the first letter of the three colours (Green, Brown, Yellow). At the exact centre of the table sits the blue ball. Further up the table is the pink ball, which sits midway between the blue spot and the top cushion, followed by the red balls, arranged in a tightly-packed triangle behind the pink (the apex must be as close as possible to the pink ball without touching it). Finally, the black ball is placed on a spot 32.5 cm (12.8 in) from the top cushion, centred from left to right so that the brown, blue, pink, and black balls all sit on an imaginary line that bisects the table along its length. The objective of the game of snooker is to strike the white cue ball with a cue so that it strikes the object balls in turn and causes them to fall into one of the six pockets. Points are scored for potting balls legally, in accordance with the rules described below, or in the event of a foul committed by the opponent. The player who scores more points wins the frame, and the first player to win a set number of frames wins the match. A match usually consists of a fixed, odd number of frames. A frame begins with setting up the balls as described above. 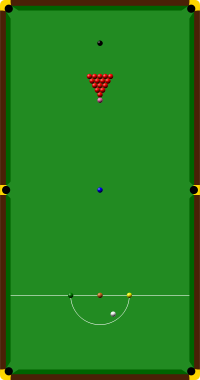 A frame ends when all balls are potted, or when one of the players concedes defeat because they are too far behind in score to equal or beat the score of the other player. A match ends when one player has won enough frames to make it impossible for the other player to catch up. For example, in a match of 19 frames, the first player to win 10 of them is the victor. At the beginning of each frame, the balls are set up by the referee as explained. One player then takes a break-off shot, placing the cue ball anywhere inside the D and attempting to hit and/or pot one or more of the red balls. It is common for players to start by placing the ball on the line, between the brown ball and either the green or yellow ball. The break-off alternates between players on successive frames. Only one player may visit the table at a time. A break is the number of points scored by a player in one single visit to the table. A player's turn and break end when they fail to pot a ball, when they do something against the rules of the game, which is called a foul, or when a frame has ended. The ball or balls that can be hit first by the white are called the ball(s) "on" for that particular stroke. The ball(s) "on" differ from shot to shot: a red ball, if potted, must be followed by a colour, a potted colour must be followed by a red, and so on until a break ends. If a red is not potted, any red ball remains the ball "on" for the opponent's first shot. Only a ball or balls "on" may be potted legally by a player; potting a ball not "on" constitutes a foul. If the cue ball comes to rest in direct contact with a ball that is on or could be on, the referee shall declare a "touching ball." The striker must "play away" from that ball without moving it, but is not required to hit any other ball because the touching ball is on. If the object ball moves, it is considered a "push shot" and a foul shall be called. No penalty is incurred for playing away if (1) the ball is on; (2) the ball could be on and the striker nominates such ball; or (3) the ball could be on and the striker nominates, and first hits, another ball that could be on. If the cue ball is touching another ball which could not be on (e.g. touching a colour when the striker must pot a red, or vice versa), a touching ball is not called, and the striker must play away from it and hit a legally nominated object ball. Where the cue ball is simultaneously touching several balls that are on or could be on, the referee shall indicate that each and every one of them is a touching ball; the striker must therefore play away from all of them. The striker scores no points for balls potted as the result of a foul. Depending on the situation, these balls will either remain off the table; be returned to their original spots; or be replaced in the positions they occupied before the foul shot, along with any other balls that were moved during the shot. For details on such situations, see Fouls below. Each frame of snooker generally consists of two phases. The first phase lasts as long as any red balls remain on the table. During this phase, all red balls are "on" for the beginning of a player's turn; the player must therefore first hit and attempt to pot one or more of them. If the player either commits a foul or fails to pot a red, their turn ends and the opponent begins to play. Each legally potted red ball awards one point and remains off the table until the end of the frame. The player continues their turn by nominating one of the six colours (yellow, green, brown, blue, pink, black) as the ball "on" for the next shot. The rules of the game indicate that the player must state the desired colour to the referee, although it is usually clear which ball the player is attempting to pot, making a formal nomination unnecessary. Potting the nominated colour awards further points (two through seven, in the same order as the preceding paragraph). The referee then removes the colour from the pocket and replaces it on the table in its original spot. If that spot is covered by another ball, the ball is placed on the highest available spot. If all spots are occupied, it is placed as close to its own spot as possible in a direct line between that spot and the top cushion, without touching another ball. If there is no room this side of the spot, it will be placed as close to the spot as possible in a straight line towards the bottom cushion, without touching another ball. The player then continues their turn, with the red balls "on" again. Because only one of the colours can be "on" at any given time, it is a foul to first hit multiple colours at the same time, or pot more than one colour (unless a free ball has been awarded, see below). If a player fails to pot a ball "on", whether a red or a nominated colour, the other player will come into play and the balls "on" are always the reds, as long as there are still reds on the table. The alternation between red balls and colours ends when all reds have been potted and a colour is potted after the last red, or a failed attempt to do so is made. All six colours have then to be potted in ascending order of their value (yellow, green, brown, blue, pink, black). Each becomes the ball "on" in that order. During this phase, the colours are not replaced on the table after being legally potted, however, any colour potted as the result of a foul is re-spotted. After all six colours have been potted, the player with the higher score wins the frame (but see below for end-of-frame scenarios). Failing to hit any other ball with the cue ball. First hitting a ball "not-on" with the cue ball. Potting the cue ball (in-off). Touching any object ball with anything but the cue ball. Touching any ball before all balls have come to a complete stop. Hitting the cue ball more than once on the same shot. Making a ball land off the table. Touching the cue ball with anything other than the tip of the cue. The exception is that while positioning the cue ball "in-hand"; it may be touched by anything except the tip of the cue. Playing a "push shot" – a shot in which an object ball (whether "on" or not) in direct contact with the cue ball moves when the cue ball is hit. Playing a "jump shot" – a shot where the cue ball leaves the bed of the table and jumps over a ball before first hitting another ball. Playing a shot with both feet off the ground. The player may lean over the table, support a portion of their weight on it, and/or use a mechanical bridge as desired, but at least one foot must remain in contact with the ground. When a player commits a foul and the cue ball remains on the table, the opponent may either play from the resulting position or, if they consider it to be disadvantageous, request that the offender play again. If the cue ball is potted or leaves the table, the opponent receives it "in-hand," allowing them to place it anywhere within the "D" for their next shot. It is sometimes erroneously believed that potting two or more balls in one shot is an automatic foul. This is only true if one of the potted balls is not "on" (e.g. a red and a colour, or two different colours). 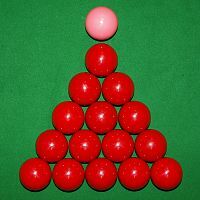 When the reds are "on", two or more of them may be legally potted in the same shot and are worth one point each; however, the player may only nominate and attempt to pot one colour on their next shot. If a free ball has been granted (see below), a colour may be legally potted in the same shot as a red or another colour, depending on the circumstances. Should a cue ball be touched with the tip while "in-hand", i.e. when breaking-off or playing from the "D" after being potted or knocked off the table, a foul is not committed as long as the referee is satisfied that the player was only positioning the ball, and not playing a shot or preparing to play one. Any other foul awards points to the opponent equal to the value of the ball "on," the highest value of all balls involved in the foul, or four points, whichever is highest. If multiple fouls are committed in one shot, only the penalty for the highest-valued foul is scored. The penalty for a foul is thus no lower than four points and no higher than seven. Not hitting the ball "on" first is the most common foul. A common defensive tactic is to play a shot that leaves the opponent unable to hit a ball "on" directly. This is most commonly called "snookering" one’s opponent, or alternatively "laying a snooker" or putting the other player "in a snooker". Because players receive points for fouls by their opponents, repeatedly snookering one's opponent is a possible way of winning a frame when potting all the balls on the table would be insufficient to ensure a win or tie. This portion of the frame is known as the "snookers-required" stage. A free ball is a player-nominated substitute for the ball "on" when a player becomes snookered as the result of a foul committed by the opponent. The snooker is considered illegitimate in this case, and the affected player is allowed to nullify it by nominating any object ball as being "on" for the first shot of their turn. Once the free ball shot is taken legally, the game continues normally; however, if the player who committed the foul is asked to play again, a free ball is not granted. For example, as illustrated in the provided picture, if the ball on is the final red, but is snookered by the black due to a foul, the player will be able to name the blue as the free ball. He could then pot the blue as if it were a red for one point. The blue will then be respotted, a nominated colour ball will be on, and normal play will resume. Note that, as a natural corollary of the rules, the free ball is always a colour ball. If the ball on is a red, then by definition it cannot be snookered via another red, as it merely provides an alternative clean shot with another ball on. If the ball on is a red, and is snookered by a colour after a foul, then logically the red is either the final one or all reds are snookered by a colour ball, meaning the free ball has to be a colour. If the ball on is a colour ball that is snookered by a red, a previous red must have been successfully potted; the snooker therefore must be self-inflicted and cannot have occurred as the result of a foul. If the ball on is a colour that is snookered by another colour after a foul, all reds must have been already potted; thus the free ball still has to be a colour ball. Interesting situations could occur if somehow both the free ball and the real ball on are potted. If a colour were the ball on (all reds were potted), and both the free ball and the actual ball on are potted, only the ball on is scored. The free ball is respotted while the actual ball on will stay off the table. This is the only time when attempting to pot a colour that two balls can be potted without a foul occurring, because technically speaking both of the potted balls are on. If the ball on is red and both the free ball and a real red are potted, then each ball potted is scored as a red for a total of two points. The colour free ball is then re-spotted and the red remains off the table. By the same logic, a player may hit the free ball into a real red in order to pot the latter (a plant). Going back to the picture above, the player could nominate the black as the free ball and use it to plant the real red. If the player potted both balls in one shot, two points would be awarded and the black would be re-spotted. Not potting the free ball incurs no penalty, so the striker may play a snooker using the free ball, gratis. However, if said snooker is achieved by having the free ball obstructing the ball on, then the strike is a foul and a penalty of the value of the ball on is awarded to the opponent. The reason is that the free ball was to be treated as the ball on, and one cannot snooker a ball on by another ball on (following the same logic that a red cannot snooker another red when red is on). The only exception to this is when there are only two balls remaining on the table, namely pink and black. If the opposition somehow fouled trying to pot pink, and illegitimately snookered the striker with the black, then it is fair for the striker to snooker the opposition "back" with the free black ball. A free ball scenario does not occur when the ball gets stuck at the edge of a pocket jaw (commonly referred to as "angled") in such a manner that the player is unable to hit any ball on. This is because according to the official snooker rules a ball is snookered only if its way is obstructed by balls not on. In this scenario, after a foul, the player may choose to either take the shot from the current position or ask the offender to play again, as per the usual rules on fouls. A foul and a miss will be called if a player does not hit the ball "on" first (a foul) and is deemed by the referee to have not made the best possible attempt (a miss). In this case, the opponent has the option to request that all balls on the table be returned to their position before the foul, and require the fouling player to take the shot again. Whether the player’s choice of shot is the easiest to be achieved. If a player deliberately attempts a difficult shot with an easier escape available, intention to leave the opponent a bad position after a foul is presumed, and thus a miss will be called. Whether the cue ball has been hit with sufficient strength to reach the ball "on". Undershooting almost always results in a miss, as intention to leave the opponent in a bad position after a foul is again presumed in this case. Whether the player has tried to get the cue ball as close to the ball "on" as possible. All three of these elements must be present in order for the referee to decide that a player has made their best attempt. If either player needs penalty points to win a frame, or if either player would need them after the current penalty is applied. This is to prevent the players from running up the score due to repeated misses in worst-case scenarios. If the score difference is equal to the number of points still on the table, either before or after the penalty is applied, and the referee believes that the foul was not intentional. This is to prevent the score difference from decreasing too much, at the referee’s discretion. If it is physically impossible to play a legal shot (the snooker is truly inescapable, as judged by the referee). The player must still put sufficient strength into the shot so that the cue ball would be able to reach its target if it were not obstructed, and attempt a shot that could succeed if the obstruction were not present. If a player fouls and misses in a non-snookered scenario, and if the opponent request that they play the shot again from the original position, a second failure to make a best attempt is ruled a foul and a miss regardless of the score difference. The fouling player is issued a warning by the referee, and a third such failure forfeits the frame to the opponent. A foul after such a warning is very rare. A concession, in which one player gives up due to being too far behind to have a realistic chance of winning the frame. Concession before the snookers-required stage may be interpreted as ungentlemanly conduct and result in a penalty of a second frame being applied. The final black is potted legally (including after a re-spot), and this does not leave the score tied. The striker leads by more than seven points with only the black remaining. He may claim the win at this point, but may also elect to pot the black in order to complete a high-scoring break. A foul on the black, when the black is the only ball left. It is sometimes wrongly assumed that play continues after a foul on the black if there are fewer than seven points between the scores. This is not the case: the player who is in the lead following the assessment of a penalty after a foul, when only the black remains, becomes the winner. Failure to hit a ball "on" three times in a row, if the player has a clear sight of the ball. The referee will warn a player after a second such miss that a third miss will mean that the opponent will be awarded the frame. This rule does not apply if the player is snookered. As missing due to avoiding a direct shot on a ball is usually a tactical, rather than skill-related, outcome, this rule is rarely invoked, as a player will simply hit the ball directly on the third shot. A player may incur a verbal warning if the referee deems that they are taking too long to shoot. Additional hesitation may forfeit the frame to the opponent at the referee's discretion. If the score is tied after the final black is potted, the black is re-spotted. The winner of a coin toss by the referee decides which player will take first strike at the black; that player receives the cue ball "in-hand" for their first shot. Play then continues normally until the black is potted or another frame-ending situation occurs. The highest break that can be made under normal circumstances is 147. To achieve that, the player must pot all 15 reds, with the black after every red, followed by potting the six remaining colours. This "maximum break" of 147 rarely occurs in match play. The fastest maximum break in a tournament was achieved during the World Championships on April 21, 1997, by Ronnie O'Sullivan against Mick Price in 5 minutes and 20 seconds. If an opponent fouls before any balls are potted, and leaves the player a free ball, the player can then nominate a colour and play it as a red for one point, then nominate a colour and pot it for its normal value. It is thus possible to score for 16 reds and blacks (16 * 8), plus the values of all the colours (27), resulting in a break of 155. Under tournament conditions, Jamie Burnett achieved 148 points. The highest possible score, as distinct from the highest possible break, is unlimited and depends on the value of points scored from the opponent's foul shots when added to the player's own scored points (which may not require the highest break). However, the highest possible score from a single visit clearance is 162 (foul on the black, followed by a free ball treated as a red, as above). ^ a b c d e f "Official Rules of the Games of Snooker and English Billiards" (PDF). The World Professional Billiards & Snooker Association Limited. November 2014. Retrieved July 1, 2016. ^ "Snooker Rules". Billiard Congress of America. Retrieved May 10, 2015. ^ "Fastest 147 break in snooker". Guinness World Records. Retrieved May 10, 2015. ^ Everton, Clive (October 17, 2004). "Burnett's break goes one better". The Guardian. Retrieved May 10, 2015. Under ordinary circumstances the maximum break is 147 (15 reds, 15 blacks followed by the colours in sequence) and the professional circuit has seen 49 of these. However, an "extra" red is very infrequently created by a foul which leaves a free ball with all the reds remaining on the table. This page was last edited on 24 February 2019, at 04:29 (UTC).